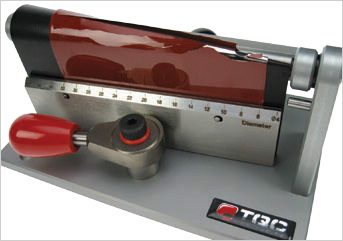 The TQC Conical Bend Test "Basic" is a simplified version of the TQC Conical Bend Test "Pro". 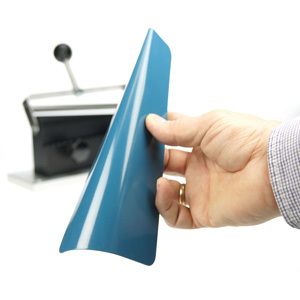 It is a laboratory apparatus to bend coated test panels over a conical shaped mandrel in order to assess the elasticity or resistance of a coating, paint or varnish to cracking, elongation and/or detachment from a metal test panel in accordance with ISO 6860 and ASTM D522. 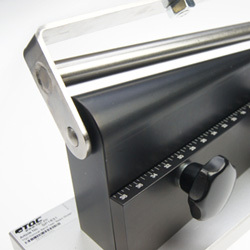 The conical shape of the bending area allows the deformation of the test panel and examination of the elasticity range of a coating over any diameter between 3.1 and 38 mm in one single test. 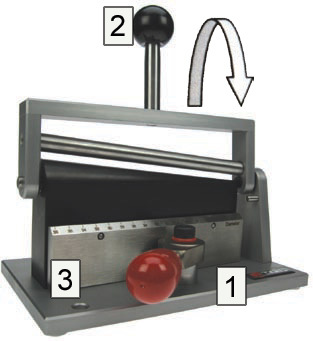 The sample panel is secured by means of two clamping knobs which has to be tightened and untightened by turning respectively clockwise or anti-clockwise. 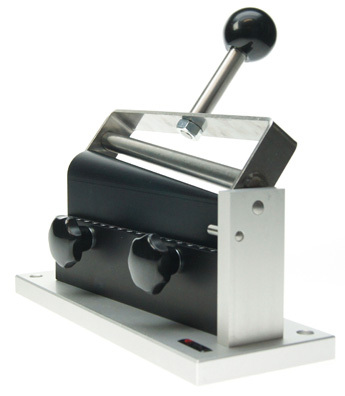 Sturdy apparatus made of a combination of anodized aluminum and stainless steel. Mandrel Range: 3.1 to 38 mm dia. Position the apparatus such that the fixation nuts are facing forwards. Loosen the nuts and move the bending-handle in the front direction so it is positioned at the same side as the fixation nuts are. Position the test panel with the coating facing towards (direction of operator) between the conical mandrel and the steel bending bar in such a way that the panel can be secured in place with the nuts. Now slowly move the bending-handle to the other side of the apparatus thus bending the test panel over the conical mandrel. Visually observe the test panel and check for cracks. If any cracks have occurred note the diameter of the beginning and end of the crack. Loosen friction nuts and remove test panel. Make sure to keep fingers and other body parts clear from the bending area when performing a test. Don't exceed the max. Panel thickness. Check the mandrel visually for mechanical damages or marks. 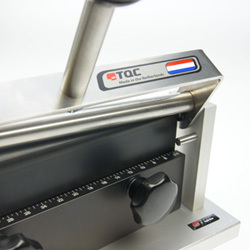 Though robust in design, this instrument is precision-machined. Never drop it or knock it over. Always clean the instrument after use. Clean the instrument using a soft dry cloth. 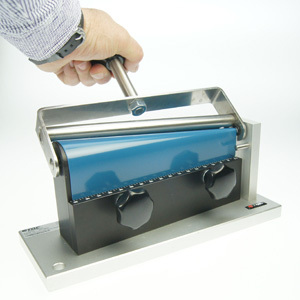 Never clean the instrument by any mechanical means such as a wire brush or abrasive paper. This may cause, just like the use of aggressive cleaning agents, permanent damage. Do not use compressed air to clean the instrument. Sturdy apparatus made of a combination of anodized aluminum and stainless steel. Ergonomic clamping device for test panels and large knob on bending arm for easy and smooth bending. Position the apparatus such that the fixation clamp (1) are facing forward. Loosen the fixation clamp and move the bending-handle (2) in the direction of the arrow so it is positioned at the side as the fixation clamp. Position the test panel with the coating facing forward (direction of operator) between the conical mandrel and the steel bending bar so that the panel can be secured in place with the clamping device (3) and tighten it with the clamp. Now slowly move the bending-handle (2) to the other side of the apparatus thus bending the test panel over the conical mandrel. Visually observe the test panel and check for cracks. If any have occurred note the diameter (3) of the beginning and end of the crack. Loosen fixation clamp (1) and remove test panel. Test apparatus used with wet and powder coatings in coatings in coating manufacturers laboratories and qc-labs of coating applicators. Make sure all actions such as the clamping and bending are carried out without using any heavy forces, don’t exceed the max panel thickness. Check the mandrel visually for mechanical damages or marks. Make sure to keep fingers and other body-parts clear from the bending area when performing a test.